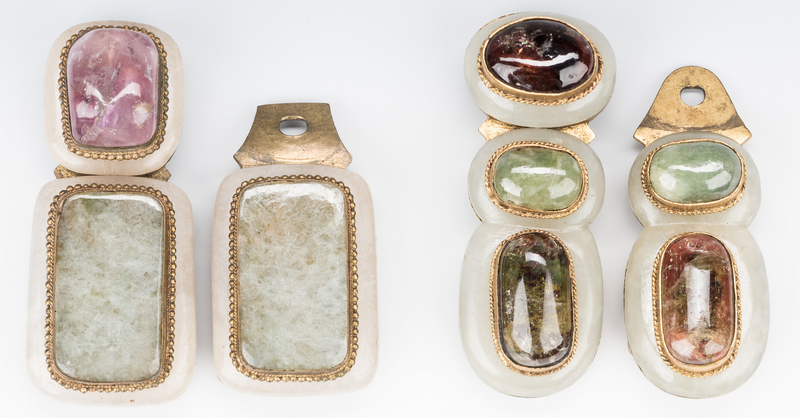 Three (3) Chinese quartz, agate, jade and gilt bronze belt ornaments, including one with three brown stones (3 1/2" L), one with a purple quartz center stone flanked by two celadon jade stones (3 7/8" L) and one with three quartz and two jade stones (4 1/8" L), all mounted onto white jade bases and inset into gilt and foliate engraved bronze bases. Late 19th/early 20th century. Provenance: Private West Tennessee collection. CONDITION: 1st 2 buckles with some natural inclusions to white jade, all overall very good condition.